The last two posts have focused on Dr. Richard Hill and his family. When Hill and his wife left the country for Madeira to escape his creditors his large family was broken up. Seven of his nine children remained in America under the care of his daughter Hannah and her husband, Dr. Samuel Preston Moore. Two—Mary and Harriet—accompanied their parents to Madeira. Daughter Deborah later joined them there. These three daughters married and lived abroad. Daughter Milcah Martha was born in Madeira and eventually returned to the United States. 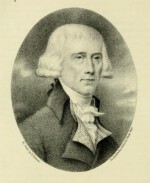 Son Henry Hill, who was raised by his sister in America, and his English brother-in-laws joined his father in the wine business that Hill had established in Madeira. With a lodge in Madeira and offices in London and Philadelphia it became a thriving venture supplying much of the wine to the American colonies and then the United States in the second half of the eighteenth century. Henry inherited a large share in the firm when his father died in 1762 making him a man of considerable wealth. When Philadelphia became the capital of the United States in 1790, President George Washington and the officers of the new government moved there establishing what became known as the “Republican Court.” They rented and refurbished large houses and the wealthy residents of the city built or redecorated their own mansions and delighted in being part of the lively social scene. The latest fashions in furniture and decor from London and Paris were much sought after. Henry Hill and his wife Ann Meredith built a house on Fourth Street between Union Street and Cypress Alley. 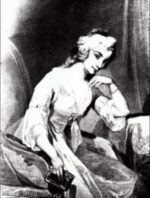 Hill sought the advice of his sister MARY HILL LAMAR, who lived in London, on what furniture would be suitable and solicited her help in making appropriate purchases for him. Here is a letter containing Mary’s advice. Captain Willet being to sail to-morrow, you may depend on the above going by the first opportunity after all are ready. As to the chimney-piece and slab, a handsome white marble which is the fashion for the best room and looks beautifully, cannot be got under £40 or £50. By what you say of Mr. White’s, it cannot be such as I mean, which is entirely marble without any wood. His I imagine is only a plain slip of wood in front; such, here, are only put in bed and back rooms; the best dining parlors of late have also entire marble pieces. If the foregoing articles cannot be got ready to go very soon, I think to send as soon as possible the paper; the most fashionable is such as will suit any colored furniture. Yellow is a color quite the fashion at present, and from experience I know it wears and cleans the best of any. You say nothing of chairs. I shall strive to make the upholsterer give some plans, when, if you want any you can choose. I think the best for America are cane seats with hair cushions covered with silk, which may be taken off in summer; the sofas made in the same manner. A best room furnished in the present style and plainest taste is nothing more than two sofas, twelve or more chairs, a marble half circular table under the glass or glasses, glass lustres on the slabs to hold four lights, the lowest price of which will be twelve or fourteen guineas the pair, or in place of them, silver or plated branches for three candles; or in place of the marble slabs, inlaid wood, which are very pretty and come cheaper. Neither tea or card tables stand in the best room, but are brought in when wanted; in the back room or common sitting room, one or two sofas according to the size of the room; chairs the same as in the best; a small breakfast table, one or two card tables, a double half oval under the glass, or in lieu, the tea or card tables. The India counterpanes make very pretty curtains for a back room or best bedroom; as one counterpane of the largest size makes a window curtain, they come much cheaper than a good English cotton; some time ago they were to be got for three guineas apiece, but are not to be met with now; they make beautiful beds lined with white, and white clothes [bed linens] and testers [curtains for four-poster beds]. I have written you a long scrawl. Henry Hill’s wife died in 1785. He died from the yellow fever epidemic that struck Philadelphia in 1798.